A range of single and double leaf drainage doors designed for use in exterior applications or in those situations where there is concern of water or other liquids entering the access opening. These units are supplied with a threaded drain coupling, fully welded to the channel frame, for connection to a dry or wet well in the field. Constructed of 6.35 mm aluminium diamond pattern plate and reinforced for a 1464 kg/m² live load. Features all anti-corrosion hardware, standard debris gasket and a versatile anchoring system for ease of installation. Type J-1 AL, 610 x 610 mm: 30 kg. Type J-2 AL, 760 x 760 mm: 40 kg. Type J-3 AL, 915 x 760 mm: 44 kg. Type J-4 AL, 915 x 915 mm: 49 kg. Type J-5 AL, 1065 x 1065 mm: 61 kg. Type J-6 AL, 760 x 1220 mm: 57 kg. Type J-7 AL, 915 x 1220 mm: 64 kg. Type J-8 AL, 760 x 1525 mm: 67 kg. Type J-9 AL, 915 x 1525 mm: 75 kg. Type J-10 AL, 915 x 1830 mm: 85 kg. Type JD-1 AL, 1220 x 760 mm: 66 kg. Type JD-2 AL, 1220 x 1220 mm: 79 kg. Type JD-3 AL, 1220 x 1830 mm: 106 kg. Type JD-4 AL, 1525 x 1525 mm: 109 kg. 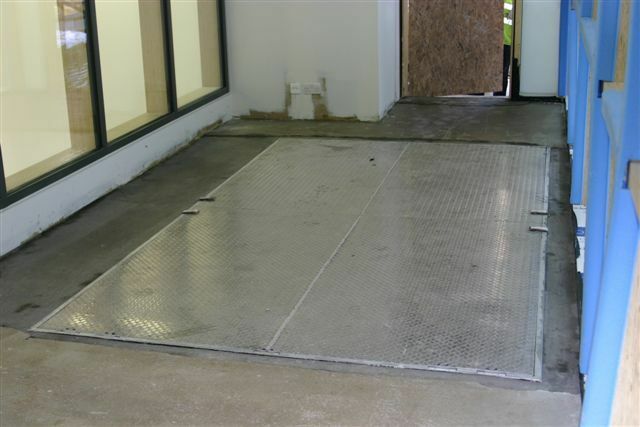 Type JD-AL doors can be manufactured to virtually any size to meet particular access requirements. Size 610 x 610 mm. Size 760 x 760 mm. Size 915 x 760 mm. Size 915 x 915 mm. Size 1065 x 1065 mm. Size 760 x 1220 mm. Size 915 x 1220 mm. Size 760 x 1525 mm. Size 915 x 1525 mm. Size 915 x 1830 mm. Size 1220 x 760 mm. Size 1220 x 1220 mm. Size 1220 x 1830 mm. Size 1525 x 1525 mm.